Stay on top of the city in the city! With great views over Dublin and the Liffey, our penthouse apartments right in the middle of cultural temple bar offer clean, comfortable and affordable accommodation. The Oliver St John Gogarty penthouse apartments are located in Dublin's premier tourist location, temple bar. Our full serviced, tourist board approved accommodation is located beside all of Dublin's major tourist attractions such as trinity college, the Book of Kells, Grafton street shopping, the Guinness storehouse and all major galleries and museums. Our centrally located apartments are perfect for large or small groups (we cater for up to 26 people in adjoining self-catering apartments alone) so if you're planning a hen, stag, celebratory weekend or rugby tour just call us and book it today! And don't forget... 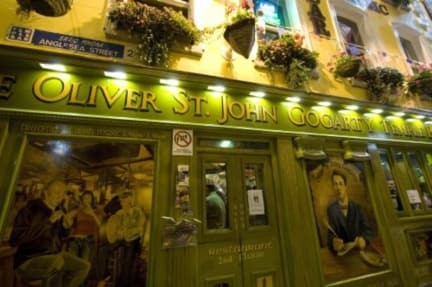 The Oliver St John Gogarty bar is located within the complex so you'll be entertained from dawn to dusk! During your stay at the Oliver St John Gogarty Penthouse apartments, you can do as much or as little as you like. Enjoy all the cultural activities this quarter has to offer by day, visit the Guinness storehouse, Christchurch cathedral, hit the shopping hotspot of Grafton street, watch as temple bar comes alive by night, or simply relax in your quiet and relaxing haven, and let the world, like the Liffey flowing through Dublin, just pass you by. With our apartments (sleeps up to six people) a self catering break in temple bar is more affordable than you might think! super-central location - you will have no need for any transport, as everything in the city centre is on your doorstep! Cancellation received 14 days or less before arrival date will result in one nights accommodation being charged. Cancellations made 48 hours or less before date of arrival will result in 100% of accommodation price being charged. During Peak Events ( St Patricks Weekend, Rugby Weekends, New Years Eve) cancellations made less than 7 days in advance will incur 100% charge for all accommodation. Please note there are 5 two bed apartments and 1 three bed apartment, sleeping 4 and 6 respectively. All apartments have one en suite, and one bathroom, a fully fitted kitchen, dining room and living room.